Packed and ready to go outside the Hotel Dilaver in downtown Erzurum. I took my leave of the friendly but still-disbelieving staff of the Hotel Dilaver and started the long 1300km haul to Istanbul. But for today, it was only about 450km from Erzurum to Sivas – a relatively easy day’s ride thanks to the excellent highway, even at my dawdling pace. My new route to Istanbul would take me through parts of Turkey I hadn’t originally planned to visit so I didn’t know what lay ahead of me. 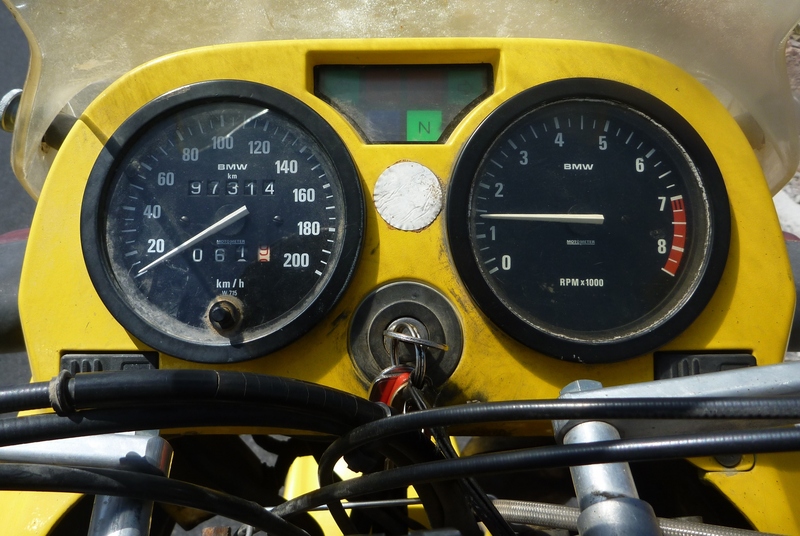 About 60km out of Erzurum the bike clicked over exactly 10,000km since I had left Kathmandu. I pulled off the highway to take a photo to mark the occasion. Some friendly Turkish policemen pulled up beside me to check if everything was OK. They were very interested in the map of the world on my RHS pannier that charted my progress across Asia. They too were amazed that I had been able to travel freely in Iran. They firmly believed it was a police state worse was than Russia (I assumed they meant the old USSR). My pleasant chat with the curious constables over, I resumed my trip to Sivas, all the while looking out for something interesting to look at. 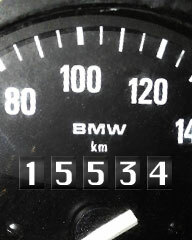 Exactly 10,000km since I left Kathmandu. And the engine is still idling away nicely. 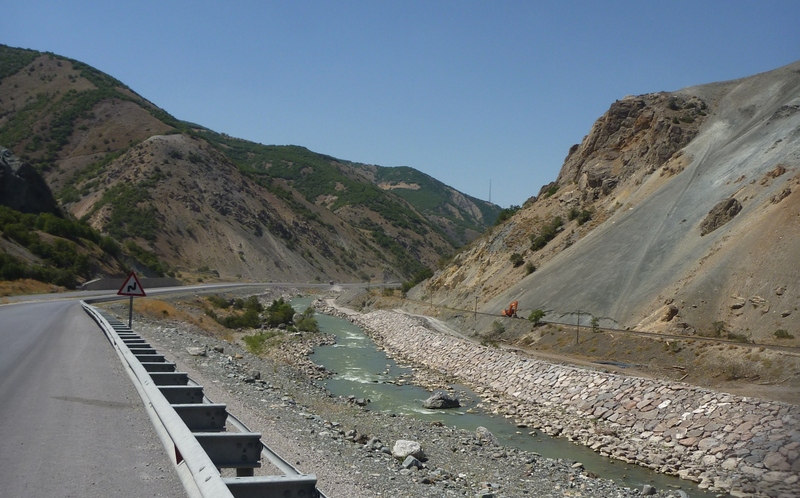 Halfway between Erzurum and Erzincan the road started to follow a small creek for many kilometres. The numerous signs simply said “Firat 1”. I became very curious about what “Firat 1” meant. The only detailed map of Eastern Anatolia I had was an old one in Farsi that I had been given in Mashhad. So that was worse than useless. Eventually it clicked that this small creek was actually the head waters of the Euphrates River – one of the most important rivers in the history of human civilisation as it waters the ancient lands of Mesopotamia downstream in Iraq. This non-descript stormwater drain is the not-yet-mighty Euphrates river. The highway continued to be impeccable with very little traffic so I was able to make it to Sivas by early afternoon leaving plenty of time for the ritual of the accommodation tango. 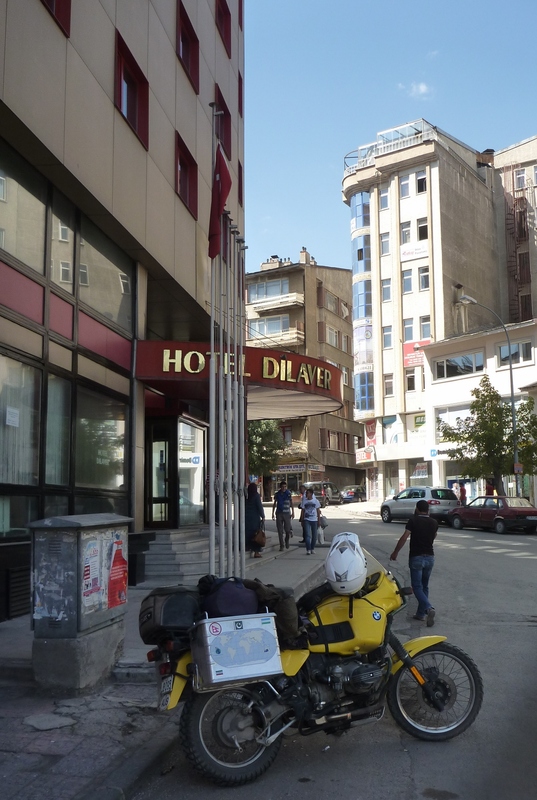 I had met a Turkish family at a lunch stop outside Erzincan and they had recommended the Hotel Fatih in Sivas. Unfortunately, it was full when I arrived. However, that was no problem for hyperactive, gangly youth behind the counter. He had obviously had one too many Red Bulls for the day as he leapt straight over the counter and shouted, “Follow me!” as he bolted out the front door. Somewhat bemused, I obeyed his instruction, decidedly less energetically, and followed him out the front door. Only to find that his latest caffeine hit had worn off two doors down the street at another hotel, the Otel Çakir. The stylish rooftop beer garden – sadly, a cruel hoax! “They have room. You stay here”. Now that’s what I call service! 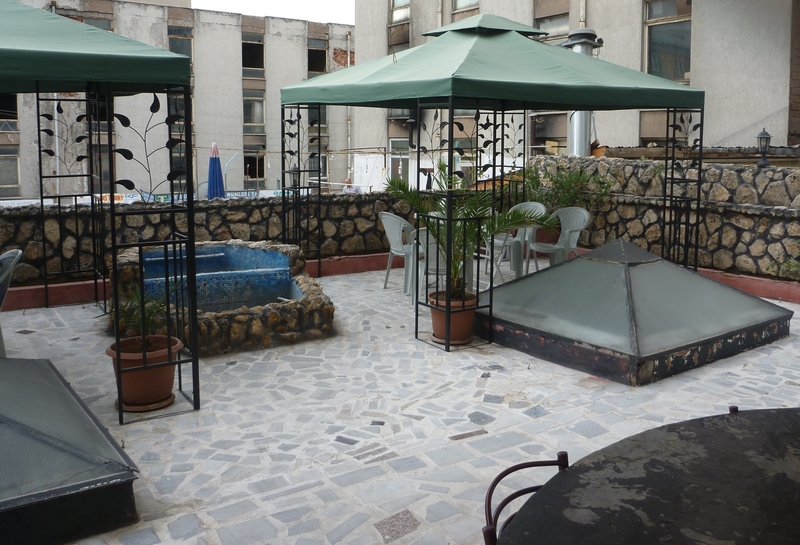 The Otel Çakir was great – friendly staff, cheap local meals. It even boasted a rooftop beer garden. What Australian can resist a great rooftop beer garden? There was only one slight problem. Due to some strange quirk of Turkish liquor licencing laws, the Çakir was unable to sell alcohol. If I wanted to enjoy a cold beer I would have to buy it from the corner shop and drink it in my room. WTF? Such a tragic waste of a perfectly good beer garden! Tant pis! After dinner I assuaged my disappointment with a stubbie (500mL) or three of Turkey’s finest ice-cold Efes. Tomorrow, I would ride the 350km to Kirikkale and then decide whether to continue the last 75km and plunge into the anarchy of Ankara’s traffic or simply call it a day. Thanks, Nev. Will drop in and see you one day. Cheers, Brian.